GSK asked us to come up with a project to promote Chronic Obstructive Pulmonary Disease (COPD) and raise public awareness about it. 1. Promote knowledge about COPD amongst the public at large. 2. Raise awareness about the importance of early diagnosis. 3. Comprehensive patient care on the part of professionals. 4. Targeted at: doctors, pharmacists and patients. Grupo SANED proposed a disease awareness campaign to raise the public profile of this little-known condition. 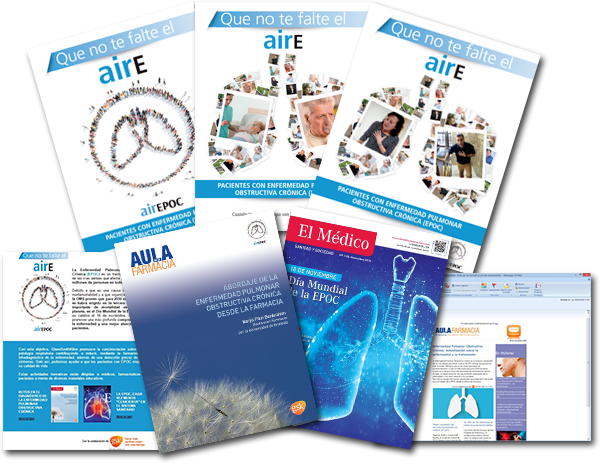 Various actions were carried out, such as the printing of brochures, articles and reports in the magazines “El Médico” and “Aula de la Farmacia”, as well as a supplement in “El periódico de la Farmacia”. Various email marketing campaigns were run, addressed at primary care physicians and pharmacists. The project’s success led Grupo SANED to begin work on a second part.